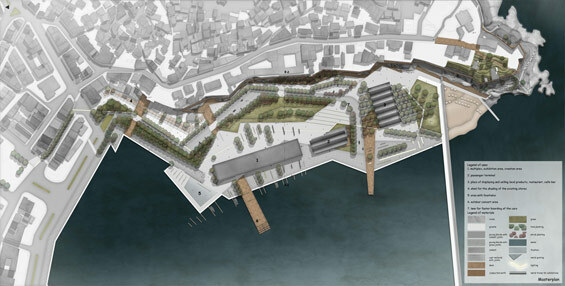 Elli Nikolaidou’s thesis develops a redesign of the Customs Office area in Kavala, with a principal goal to reconnect with the city. 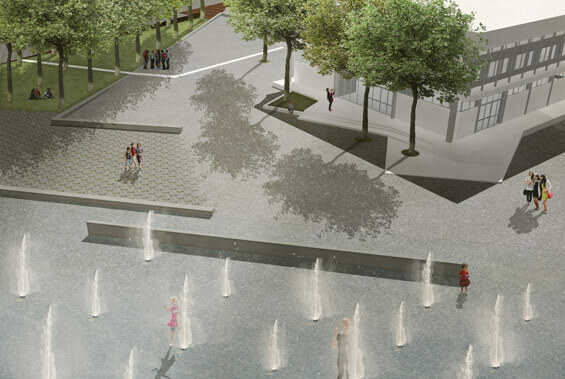 The regeneration of the space will allow its conversion to an important part of the life and the motion of the city center. Thanks to the creation of a network of pathways and spots of interest for pedestrians, the development of the natural element and the reuse of buildings, the area will be active all day long. The Customs Office area is located southeast of the city center and west of the old city, while it is bounded by the coastal wall and the sea. Assuming that the waterfront is a continuous path for pedestrians, we could say that the Customs Office area is its closure, being one of its few and its largest wide places. However, despite its potential, the area still remains detached from the residents of the city. This is due to the absence of paths for pedestrians, the lack of green and the fact that the buildings are either empty or they accommodate public services, operating only during the day. Specifically, the Customs Office is now used by the Financial Crime and the State Laboratory, while the rest of the building remains unexploited. Then, there is also the building of port workers, the passenger terminal and the warehouse-workshop. Finally, the old disinfestation building and the old warehouses are also unused. Concerning the pathways, their conception came out from the existing linearity of the old wall and the sea wall (see figure 1), forming strips which are either parallel or they intersect with each other, providing a variety of pedestrian movements (see figure 2). These strips are the following: 1) the path which is parallel to the sea, 2) the path down the old wall which connects the area with the city center, 3) the path which is parallel to the wall and joins the area with the old city and the shipyard and 4) the path that links the buildings with each other and receives the traffic from the others. The concept of the strips is also adopted by the road which leads to the passenger station and by the planting. Three paths widthwise the area help in connecting the strips and in enhancing the ‘escape’ towards the sea. 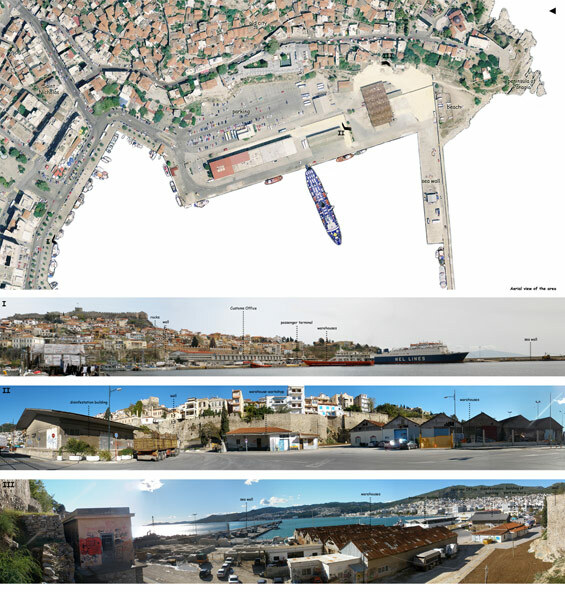 Concerning the buildings, of the six buildings that have been mentioned, it is proposed that only the Customs Office, the passenger terminal and the old warehouses should be retained. Except for the passenger terminal which will continue to serve the passengers, the other buildings will accommodate uses of culture and entertainment. 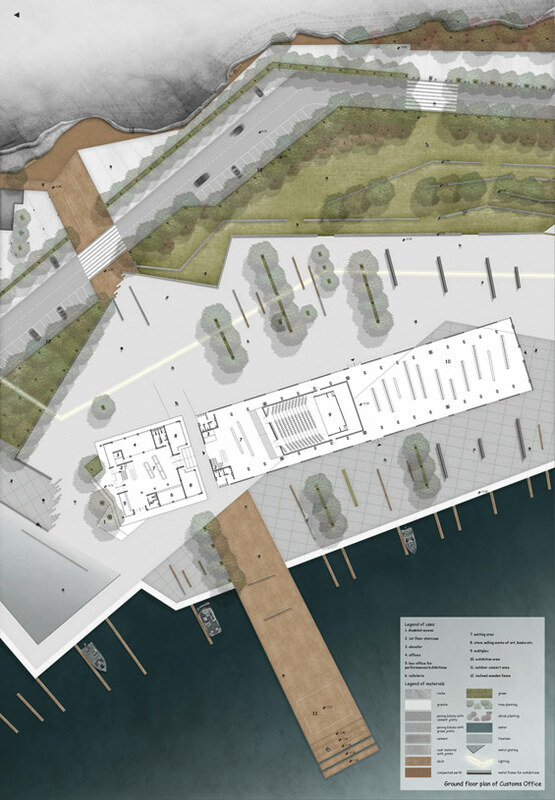 Specifically, the Customs Office will be transformed into a multiplex for temporary or permanent exhibitions but also into an area of creation for the artists, while the old warehouses will be converted into a place of displaying and selling local products as well as into a restaurant and a café-bar. These strips form in practice the following pathways: 1) the path along the sea –made by paving blocks with grass joints-, 2) the path down the wall –made by cast material with joints- which starts from the main square and then moves in front of the existing stores, for the shading of whom it is proposed to create a shed which also defines their permitted outdoor area; this path provides also the necessary area for the parking, 3) the path on the rocks –made by metal frame and wood-, which moves like a thin peel alongside the wall until it is united with the old city, the shipyard or the existing paths, bolted on rocks or relying on metal columns, accessible almost everywhere for disabled persons and 4) the path that receives the load from all the activities –made by granite-, starting from a prominent public area with fountains and lighting and finishing in a more private beach at the back, linking at the same time the buildings together. 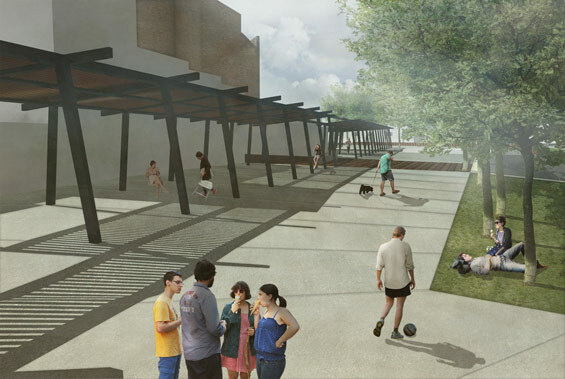 These paths are connected via three wooden platforms, which can also serve as outdoor concert areas. 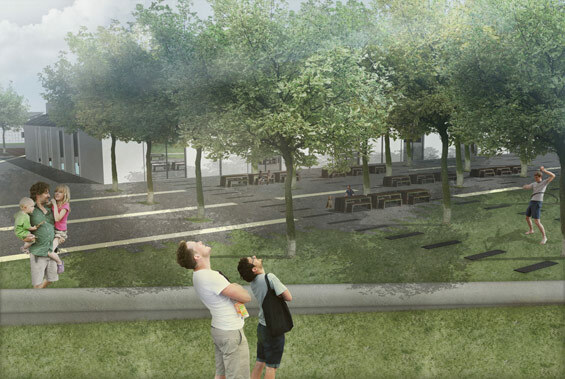 The concept of strips is also followed by the green, by the floor lighting which connects the main square with the sea wall, as well as by the benches and the metal frames used for indoor and outdoor exhibitions.